Expectation shined on their faces. 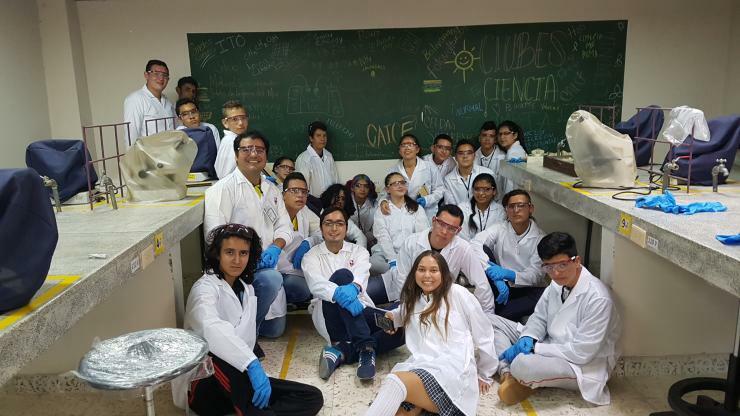 It was a sunny week in June in the southwest part of Colombia, located in the northeastern part of South America, and 37 students from public schools were ready to learn about organic solar cells. 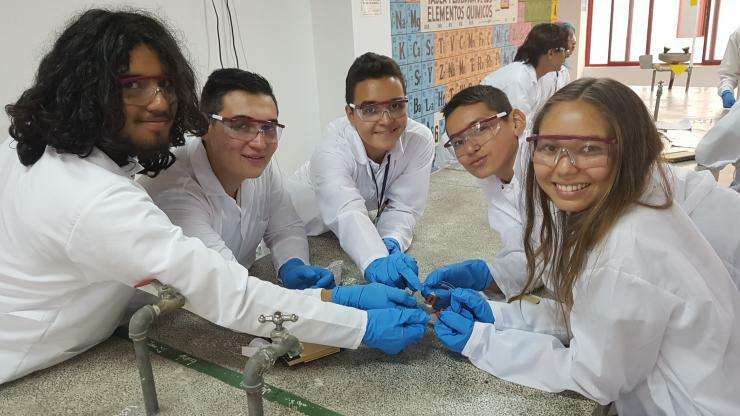 These specially selected students were participating in Clubes de Ciencia Colombia (Science Clubs in English) and were guided by Colombian professors Alejandro Ortiz and Giovanny A. Molina from Universidad del Valle (UniValle) in Colombia, Ph.D. student Jose D. Perea from Friedrich-Alexander Universität (FAU) in Germany, and Victor A. Rodriguez-Toro who is a Ph.D. student from the School of Electrical and Computer Engineering at the Georgia Institute of Technology (Georgia Tech) in the United States. Clubes de Ciencia is a non-profit organization created by Harvard University graduate students which provides hands-on STEM workshops to students in developing nations. The Clubes de Ciencia programs aim to inspire and mentor future generations of scientists and innovators through international scientific networks consisting of volunteer researchers from all over the world. In 2018, several programs were selected for development in Colombia. Among them were two clubs on organic solar cells. “The opportunity to work with kids from my home country in a STEM area that I specialize in was really special. It feels great to be involved in activities where I can stimulate the curiosity and love for science and engineering in younger generations,” said Rodriguez-Toro, who is conducting research on organic photodetectors and solar cells in the Kippelen Research Group, part of the Center for Organic Photonics and Electronics (COPE). The week-long program was conducted simultaneously in two different cities in Colombia: Cali, Valle, which is a large urban city with a population of two million, and the smaller, rural town of Caicedonia, Valle. High school students from these different areas were taught all about solar power and how to fabricate organic solar cells. 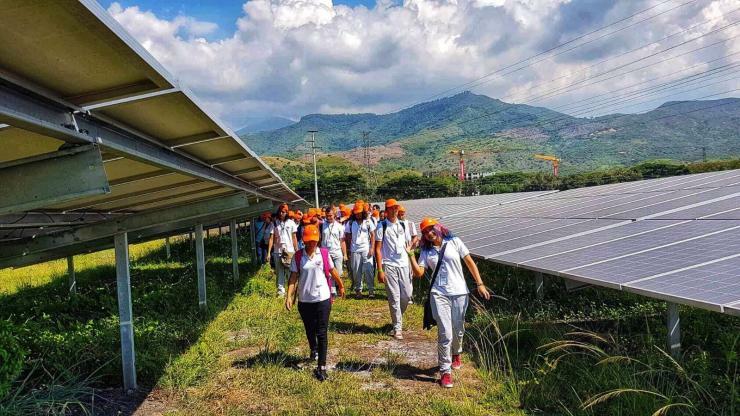 They also visited silicon-based solar parks and were able to experiment with gadgets that are powered by solar energy such as flexible cellphone chargers and toys. At the end of the program and with the experience gained, students were able to work on innovative ideas and present them to the community in a poster session about how organic solar cells might impact fields such as climate change, transportation, agriculture, the internet of things (IoT), wearable electronics, biomedical fields, and even world peace. 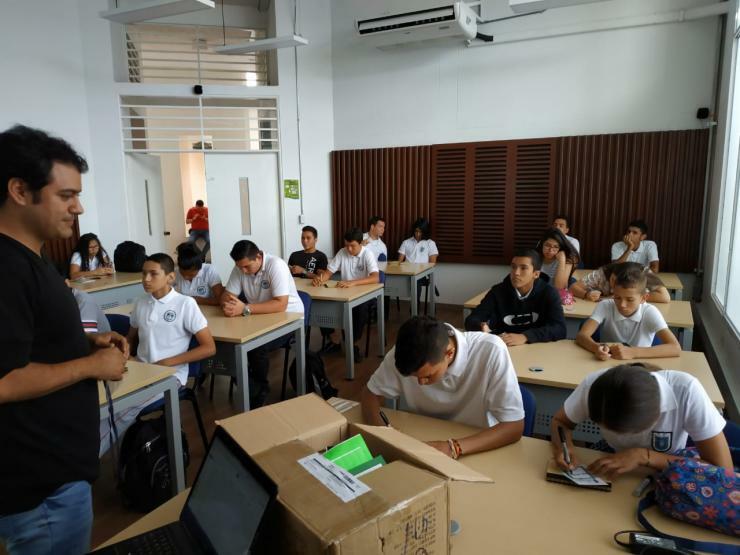 The good news traveled all the way to Barranquilla, in the northern part of Colombia, where Rosmery Suarez, from STELLAM Foundation, and Diana Gasca, from Tecnoglass Inc., were taking part in an educational program called “Cubes in Space” (CiS). CiS is a partnership between IDoodle Learning, Inc. and the National Aeronautics and Space Administration (NASA) that allows students and educators to send their experiments to outer space in a sounding rocket or near to space in a scientific balloon. Suarez and Gasca invited the team in Clubes de Ciencia to join them in CiS. As a result, three of the solar cells produced by the students in Caicedonia were shipped to NASA facilities in August 2018, and they were included as part of the payload for a suborbital flight that took place on September 9, 2018. The solar cells were placed in a soccer court-size air balloon and flew as high as 30 km above sea level. In that part of the atmosphere, the balloon and cells faced extreme conditions, including corrosive mono-atomic oxygen, temperature changes, high frequency UV-radiation, and microgravity. One of the organic samples (a control sample) was kept on Earth under regulated conditions, so changes in the samples sent to space could be compared with the one kept on Earth. The results are yet to be determined. The Cubes in Space experiment is great way to continue the work done by Clubes de Ciencia. Teachers and students can explore scientific concepts and hypotheses by anticipating the possible effects of the conditions experienced by the samples. The unique opportunity to send experiments up to space keeps them motivated to pursue the path of scientific discovery. 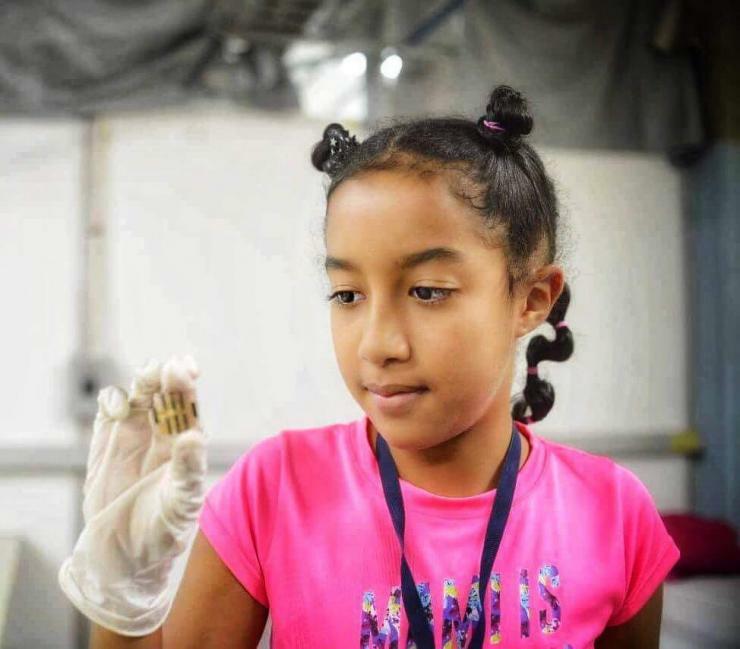 “It is really pleasing to know that you were part of a project supported by NASA even before you have finished high school,” said Danna Martínez, a student from Cali. “The main objective of our science club was to generate interest in the students about science and technology. I was surprised about the creative ideas that the students had to attack problems that our society is currently facing by using organic solar cells. I personally feel very happy to have been involved in this project in my country and in passing on some of the knowledge I have gained during my Ph.D. here at Georgia Tech,” said Rodriguez-Toro. From November 4-10, 2018, four out of the 37 students (Danna Martinez, Alejandro Quintero, Andrés Lozano, and Laura García) were selected to visit German institutions FAU in Erlangen–Nuremberg and the Max Planck Institute (MPI) of Colloids and Interfaces in Berlin and were guided by Ph.D. student Jose D. Perea and Ph.D. student Daniel Cruz, respectively. During their visit, they were able to receive additional training on solar cells and interact with professors, scientists, and the Nobel Prize in Chemistry winner, Dr. Gerhard Ertl. The program is expected to continue in the future with the goal of motivating younger generations to pursue STEM careers. Acknowlegements: (1) Development of Clubes de Ciencia in Colombia: high schools and students from Cali – Techno Academia SENA and Caicedonia; Instructors: Alejandro Ortiz and Giovanny Molina at Universidad del Valle (UniValle) in Colombia; Ph.D. student Jose D. Perea at Friedrich Alexander Universität (FAU) in Germany; and Ph.D. student Victor A. Rodriguez-Toro at Georgia Institute of Technology (Georgia Tech) in the United States; Student Teaching Assistants (Yair Tapias and Julian Quintero); Clubes de Ciencia Colombia; Universidad del Valle; ARUKAY; Fulbright Colombia; COLCIENCIAS; Del Laboratorio al Campo; SENA; CELSIA; and Cristoph Brabec at FAU. (2) Launch of Samples to Outer Space: NASA, Cubes in Space (CiS), Idoodlelearning Inc., Fundación STELLAM (Rosmery Suárez), Tecnoglass (Diana C. Gasca), and Ph.D. student Jose D. Perea at FAU. (3) Visit of Students in Germany: Ph.D. students Jose D. Perea at FAU and Daniel Cruz at Max Planck Institute (MPI) of Colloids and Interfaces in Germany; Jose Garcia, Osbel Zamora, Stefan Langner, and Andreas Disler at FAU, Jose Alirio Mendoza and Viviana Correa at MPI; Leidy Díaz and Diana Y. Velasquez at SENA; Cristoph Brabec and Aldo Boccaccini at FAU; and Markus Antonietti and Nobel Prize winner Gerhard Ertl at MPI. First day of Clubes de Ciencia: High school students answer questions about their preliminary knowledge on solar cells and renewable energies. They also reflect on what they want to choose as professional career. Victor Rodriguez-Toro teaching in Colombia. Second day of Clubes de Ciencia: High school students hold one of the substrates with the deposited organic film that will become the organic solar cell when the process is finished. High school students hold substrate with organic film. Third day of Clubes de Ciencia: Students from Cali and Caicedonia visit a solar farm at Celsia Solar Yumbo. Clubes de Ciencia visits the solar farm. Fourth/Fifth day of Clubes de Ciencia: Fabrication process is finished. High school students start thinking about how organic solar cells can help to solve problems related to climate change, transportation, and world peace, among others. 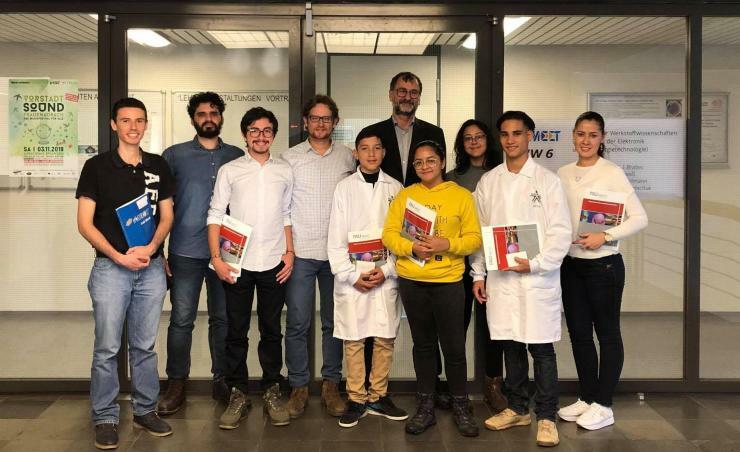 Visit to Nuremberg, Germany: After the launch to outer space from NASA installations of the fabricated organic solar cells, selected students from Clubes de Ciencia visited Dr. Christoph J. Brabec's laboratory at Friedrich-Alexander-Universität (FAU). 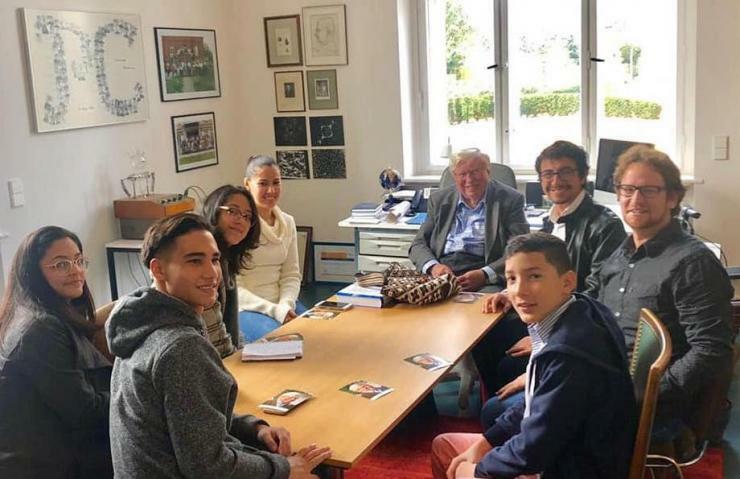 Visit to Berlin, Germany: High school students met Nobel Prize in Chemistry winner, Dr. Gerhard Ertl.